How was your weekend? The Kentucky Derby was on Saturday and it was a rainy day at Churchill Downs. In fact, the whole weekend has been rainy here in the Bluegrass. Here’s to hoping for some sunshine soon. Over the last several weeks Mike and I have been doing some work outdoors. I am counting on some sunny weather tomorrow (and the forecast looks pretty promising!) to get some painting projects done. A couple of the items I’ll be painting will end up living on our patio — so I thought it’d be fitting to share some Outdoor Inspiration on this rainy Monday afternoon. 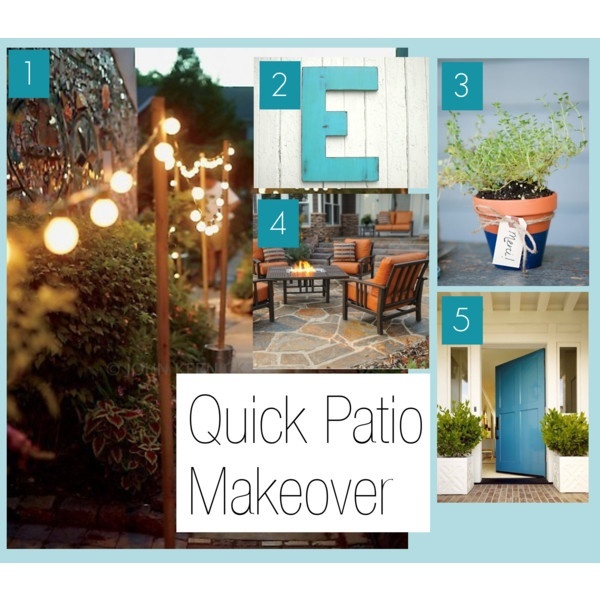 Here’s my little inspiration board for a Quick Patio Makeover. We have some tentative long-term deck upgrade plans… but they are just that, tentative. So in effort to get our outdoor space ready quickly to enjoy spring weather and lovely summer evenings, this is our plan. We already own a patio set that is very similar to the set shown (#4). The cushions have a lot of earth tones in them — burnt orange, reds, mustard-y yellows, etc. — so I wanted to brighten up the area with some fresh blues. I just added a lot of blue touches in my Entry Way and it does always seem I gravitate towards that color. For the patio, we searched yard sales for a long time for some big letters that would be suitable for the outdoors (#2). We recently found some for at a great price and they are a lovely fresh blue. Just like our front door, we plan to give our back door a fresh coat of blue (#5). We’ve got some old planters around the house, and they might be getting a new coat of paint too. I love this little terra cotta pot (#3) dipped in a fresh coat of navy blue. Some herbs are in my plans too, since our patio is right off our kitchen. I’d love to have some fresh herbs on hand for prepping dinner. Finally, we want to include a string of simple lights hanging above our dining set (#1) for some easy mood lighting. 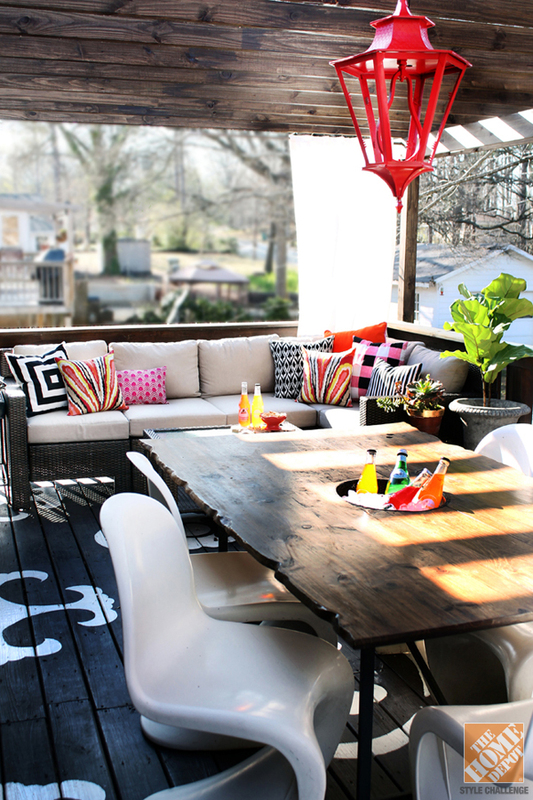 I love the way Kristin from The Hunted Interior mixed so many bright pillows on this outdoor sectional. Also, that hanging red lantern is just gorgeous and a great pop of color. 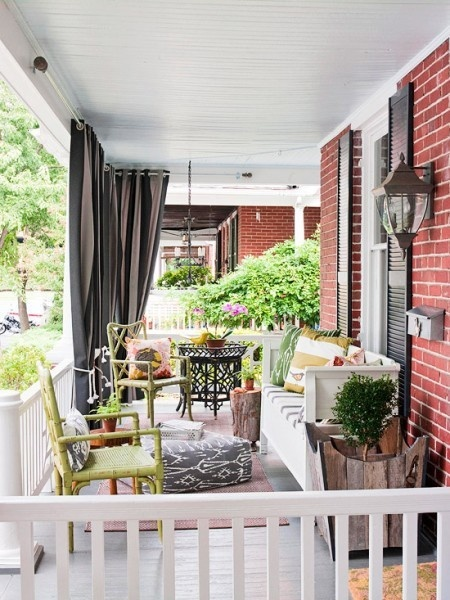 I couldn’t locate the original source on this photo, but isn’t it just a lovely front porch? My favorite detail is the painted bamboo chairs. They look so fresh in that earthy green. 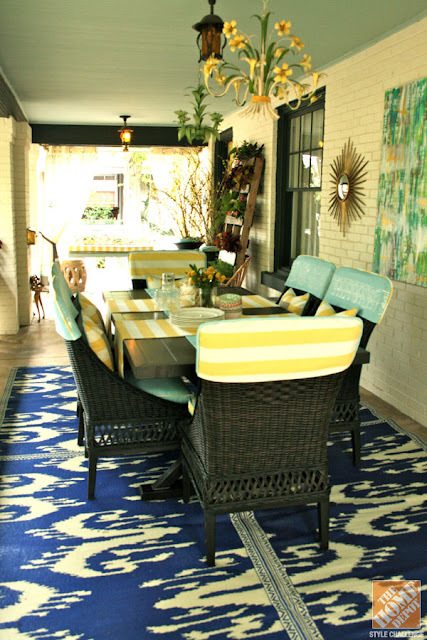 The rug on this porch is a great statement piece (and it’s actually 4 rugs! ), but I also love that Grace from A Storied Style used artwork on the wall too. It really feels like an outdoor room. 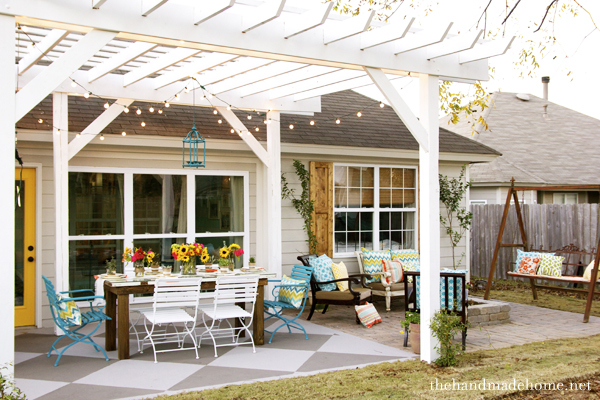 This outdoor patio makeover by The Handmade Home is an amazing transformation (go check out the before photos!). 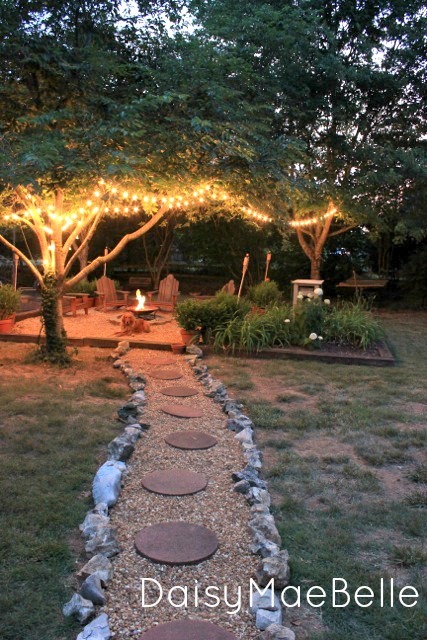 I love the lights hanging from the pergola and all of the bright colors. You can check out more inspiration on our Outdoor Decor Pinterest board. Have you been working outdoors yet this spring? What projects are you tackling? UPDATE: Want to see the final results? You can find the completed Patio Reveal here. I love your inspiration pictures! I'm sure your space will look fabulous one it'd done! Thanks for sharing this in our Summer Spruce Up Party! I love so many of those same spaces and have them on my outdoor rooms pinterest board! I especially love the fun bright colours on Ashley's patio. Cute ideas, weather is so finicky!! So cool – great minds pin alike 🙂 haha. Ashley's blog is one of my favorite places to go for inspiration! L-O-V-E her patio. NICE! I really love that color for the door on your board! So pretty. p.s New like and follower on bloglovin'! Thanks so much, Kayla 🙂 So glad you are following along! My dad and mom really want to build a new patio when the spring hits. They have already been looking at different designs but can't seem to decide on one. I think the designs here would be able to give them some ideas on things they can try.